How did you come to be involved with Nordic Bakery? It was by accident. I’ve known Nordic Bakery as an institution, which is what I would call it, since the early days—before it was even founded. I got to know Jali Wahlsten, the founder, and it has been part of my life as a customer over the last 10 years. I met Miisa Mink, co-owner, last year and she asked if I was interested in jumping on board as an advisor. The intention is that we’d like to see it grow—at the moment it’s still in baby shoes, but there is huge potential. Everybody knows Nordic Bakery: we want to take it back to its roots and really focus its identity. How would you define Nordic cuisine? What was your experience of food growing up in Finland? Clean flavours and simplicity. It’s very common in Nordic countries to live off the land, as they say, and all of my summers as a child were spent on the south-west coast where we had a summer house. My strongest early memories are of being there, fishing and growing vegetables—my grandma, wherever she could plant something, she would. The seaweed was her fertiliser. My grandfather had this barrel in which we’d smoke all the fish we caught in the morning. It’s every man’s right to go foraging in Nordic countries, even on other people’s land. We have few people, big countries, lots of wild nature and it’s very clean—it’s good that people can utilise that. That’s a strange thought for a Londoner. How authentically Nordic is Nordic Bakery? 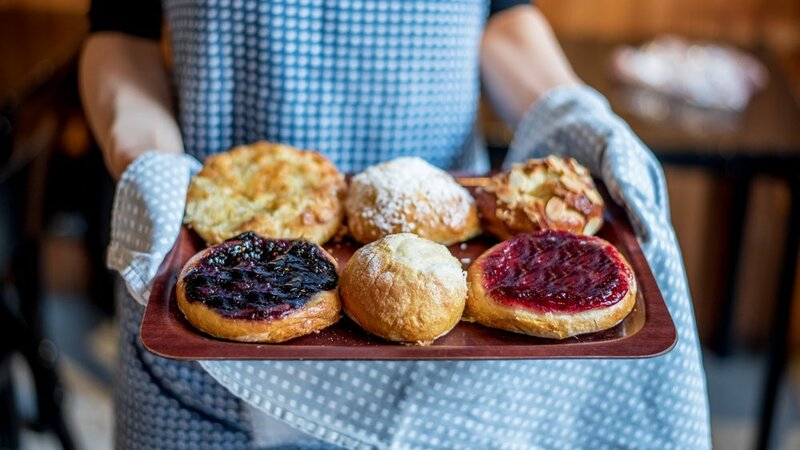 That wildness is not something that is very easy to recreate on a plate here, but when you tap into that style of cuisine, it interests people—and Nordic Bakery is very authentic in that sense. It reminds me of cafes back home. There’s definitely that feeling of a ‘Nordic moment’ when you step into any of the cafes. Do you think that connection with the land is something that’s developing in the UK? I have lived here for 20 years and I think people’s attitudes to produce and food have changed a lot, but they haven’t changed quite enough. In this country there’s a window of opportunity to develop the food culture and bring it to a different level. In Nordic countries we take pride in the land, the produce, the wilderness. In Britain, we need to look at how we can develop that further and feed the country using our own produce. That should be the future of food for smaller countries such as the UK. Unfortunately, too much produce still gets imported, particularly for the restaurant scene. Sometimes I feel very sad about the fact that the Finnish produce I buy for my restaurant Aster doesn’t always come direct, it comes via Paris. I think that’s insane. There is a lot of great produce to be found in Britain—North Atlantic seafood is some of the best in the world—but sadly a large proportion of it is flown elsewhere. That is changing, though. All the chefs I know are buying from local producers and they can name the farmer that supplies them, which is really great. It’s the only way forward. But how we can grow enough food to supply the whole country? It is challenging. When we say ‘Nordic’ cuisine, it feels like a bit of a sweeping statement. How much does it differ, country to country? Each country has its own ‘thing’. Within countries, too, there are slightly different influences. Where I’m from in south-west Finland, for example, there’s a very strong Swedish heritage—there are places that only speak Swedish, and I would say the palate and food culture is very similar to that of Sweden. However, my mother comes from Karelia on the Russian border, which is heavily influenced by Russia. The food culture is certainly different in that part of the country. That said, we have lots of similarities—that ethos of living off the land, simplicity and nature. If you look at our diet and the way we live, we also have similarities with the Mediterranean in terms of being very seasonal. But winter is hard in northern Europe. Nothing grows! You have to do your planning in the height of the season, in summer and autumn, which is why we have a tradition of smoking and preserving. I think that unifies the Nordic countries; the nature itself. We have an interesting mixture of east and west. Nordic Bakery is known for its cracking coffee. Is coffee an important aspect of Nordic cuisine? Nordic Bakery is very famous for its coffee and the quality is very good—it tastes and feels Nordic. The roast is light, it’s citrusy, fresh, aromatic. Coffee culture is very big in Nordic countries—statistics say that Finnish coffee consumption is one of the highest in the world—but we actually drink filter coffee. For me growing up coffee was just coffee, but my interest grew when I was working at La Tante Claire. Every morning Pierre Koffmann would make two cappuccinos, and he would always pick someone from the kitchen to give one to. It was outstanding! So actually, it was in the UK that I realised there’s coffee, and then there’s coffee. Saying that, there are restaurants in London I go to regularly because the food is so delicious, but they have terrible coffee. It’s not a given that if somewhere serves good food, they serve good coffee—but Nordic Bakery does both very well. All the buns and sweet things we bake in house, though I think there’s potential for us to collaborate with an artisan bakery in the future to develop the range a bit more—that’s something we’re very keen to do, so we will see how far we get with it. All the fish and the rest of the produce is from the UK. It’s important not to go too far, but on the other hand the rye bread we’ve been using for all these years is from Finland, and it’s a big part of Nordic Bakery. That will probably remain—we don’t want to make any drastic changes. The food here is generically Nordic, or perhaps Finnish-Nordic, but a big topic at the moment is whether we should do the Swedish version of the cinnamon bun. It’s a lot easier to be consistent when you make it in that way: you lay the pastry out in sheets, spread it with the butter, sugar and cinnamon mix, cut it into strips, roll them around your hand, then pull the end through to make a knot. But the cinnamon roll we do is a Nordic Bakery staple, so we will see! It could be controversial to change it. Maybe we’ll do a version of it, then continue to do the classic cinnamon roll as we’ve always done. Everything from the cafe design to the mugs is Nordic. How important are those elements in creating that eating experience that’s so unique to Nordic Bakery? It’s very important—as important as it is in a restaurant. More and more, people are eating out for the overall experience rather than one particular thing. I went to Noma Two last week and I have to say, I was humbled. A friend of mine had booked the private dining room: she said, “I have an extra seat, do you want to come?” I said, “If I don’t get a flight, I will swim to be there.” And it was like nothing I’ve ever experienced in the culinary world. The design, the produce, the materials. When the first dish came, I cried. I’m not picky at all—when I go to a restaurant I eat whatever I’m given because I’m happy someone else is cooking it!—so it’s the overall experience that really counts. Everything needs to come together. I think that’s something Nordic Bakery has always been famous for. Some call it a ‘quiet moment’, we refer now to it as a ‘Nordic moment’: that feeling of harmony when you step in through the door. It works. To be able to tick the boxes in that sense has been a huge part of Nordic Bakery’s success—and in my mind, a beautiful part of it.